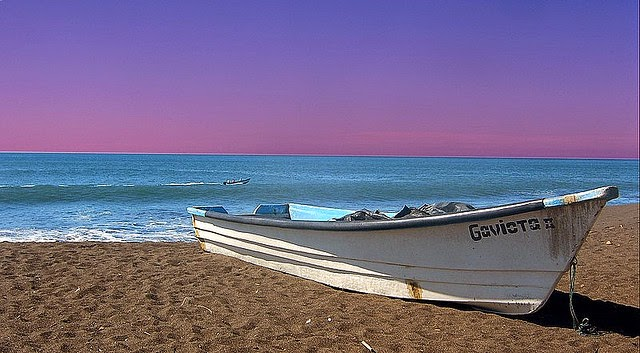 Located on the Pacific coast, Monterrico is considered Guatemala's best beach. Monterrico is known for its volcanic black-sand beaches and annual influx of sea turtles. The town is growing in popularity with foreign tourists largely because of the local sea turtle conservation efforts, surfing tourism thanks to the Pacific ocean and the laid-back atmosphere of the area. Highway improvements have made Guatemala's Pacific coast much more accessible and Monterrico has developed into the most popular beach in the country. Hotels and restaurants are better in Monterrico than in any other area on the coast, the town has adequate traveler services while still maintaining a old-town charm. Most international travelers come to Monterrico by van from Antigua, though transportation is readily available from Panajachel, Guatemala City or anywhere else in the country. Turtle conservation organizations operate in the Monterrico area due the long stretch of beach that serves as a breeding ground for four species of sea turtles. Many of the locals hunt for sea turtle eggs during the August-November season and donate a portion of the eggs to the local sea turtle hatcheries. If staying in Quetzaltenango, also known as Xela, the closest Guatemala beaches are Champerico and Tilapa. Both are just a few hours ride, and day trip tours to either can be easily arranged. At Champerico (aka Champe), the people are very friendly and small surf shops have begun to gain in popularity - with several decent restaurants, seafood lovers are sure to find some tasty cuisine. Tilapa is the northernmost beach in Guatemala, situated near the border with Mexico; this area consist of a small fishing village with a simple hotel and a decent small restaurant; the beaches are uncrowded, this is an exceptional Guatemalan beach get-a-away for the back-to-nature enthusiast. Surfing is a budding sport along the Guatemala coast and wave-chasers are beginning to take notice as local beach resorts start to focus on attracting this niche crowd. Situated just 80 miles south of Antigua, the beach at Sipicate is one of the last frontiers where you can surf the great waves of the Pacific Ocean and not have to fight for space, though it may not be long before that changes. Sipicate beach is located near the Sipicate-Naranjo National Park.